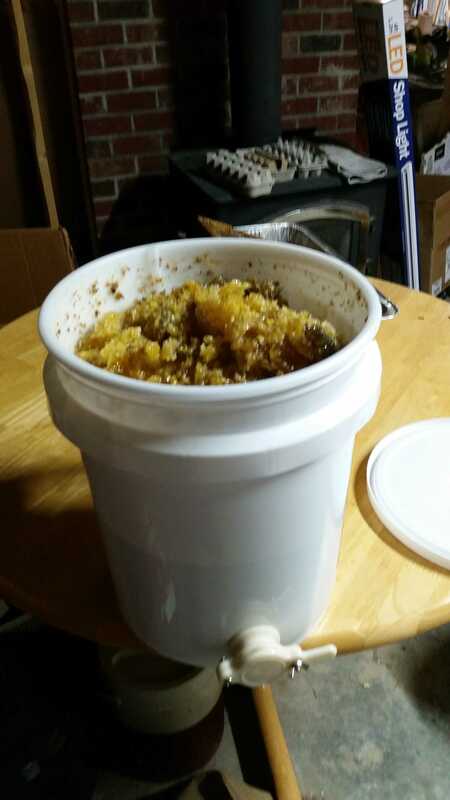 I still had a medium hive body with 10 frames that I brought inside last spring after my hives died out. 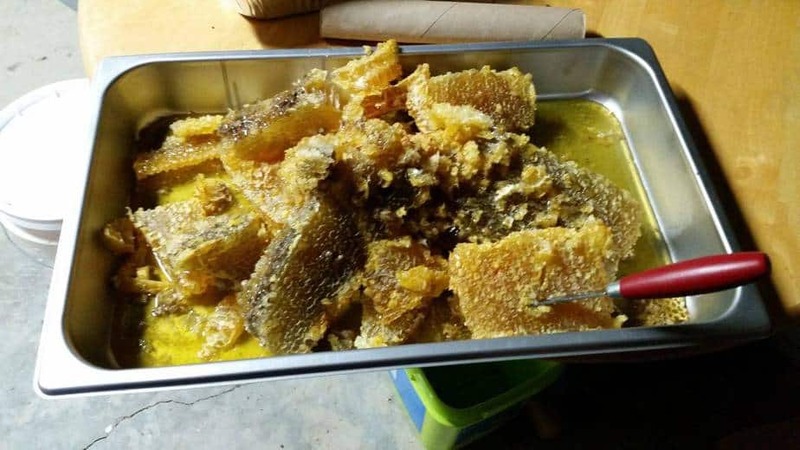 I went through it and I found it was about 3/4 full of honey. My goal is to provide plenty of honey to the two nucs of local bees I got in the spring. I use foundation-less frames so any of the frames that had cross-combing, broken or not centered in the frame, leaving only the best comb. I only ended up cutting out part of most of the frames. I got a steam table pan as it is a good size to cut the comb into. I’m finding that if I cut each side of the comb in half length-wise, in effect cutting each cell in half and allowing the honey to drain out. 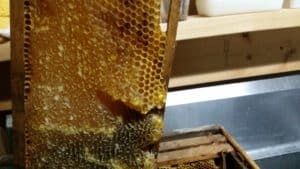 I use the crush and strain method of harvesting honey. So this mashed up comb and honey goes into the top of my bottling bucket. 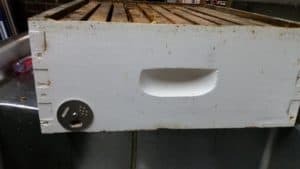 There is a mesh strainer that sits in the top that allows the honey to go through and keeps the wax and other stuff in the top and I scoop that out. I still need to work out the best way to process the wax. 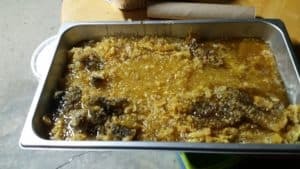 I suspect there is still some honey and I don’t know if I should just heat up all of it and let it separate and then strain any honey. 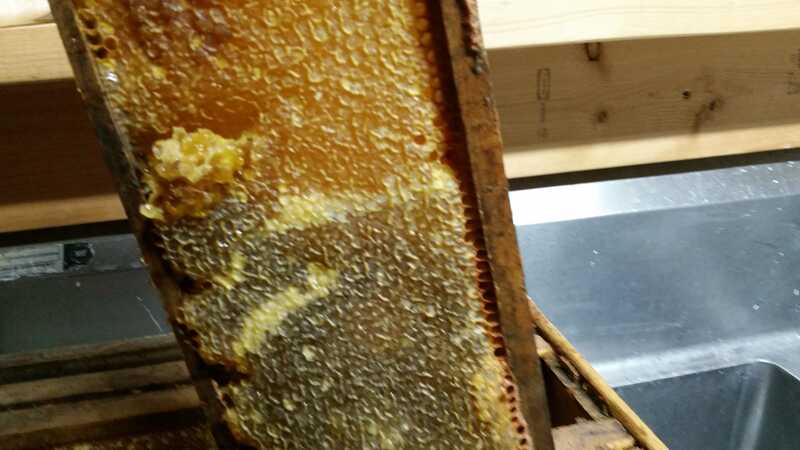 There is some old brood comb in there and I don’t want that crud in my honey or wax. 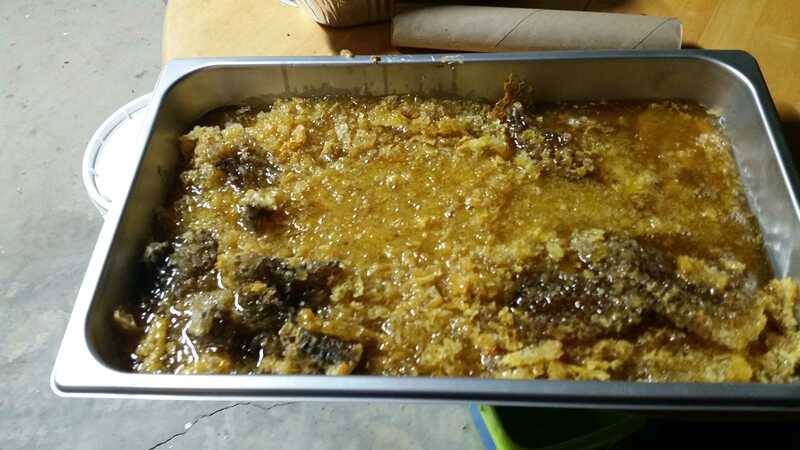 If it was all fresh comb I wouldn’t worry about heating it up until the wax melts and then letting it separate naturally. Something to figure out in the winter. I also added a small entrance with a metal disk that I can change from open to workers only to vented. I also made a new cover out of 2″ x 10″ lumber. Below is a quick video I shot after I added the hive body to the stack. My son came in after mowing the lawn saying “Dad we have a problem”. He proceeded to explain how he was having problems steering and when he pulled it into the garage he noticed that one of the back tires was flat. We found a nail in the tire and rather than take it someplace I pulled out the plug kit. I took advantage of this to teach my son how to plug a tire, and he did it all. If it fails he will have to walk home, from the front yard 🙂 If you look at the picture above you will see the little bit of the orange plug sticking out. Frequently you can plug a tire without even taking it off the car, mower or whatever else. This can be a real advantage if you are out away from your home base. Consider being on the side of the road or pulled into a gas station. If you catch it before too much air escapes, and you are quick you can have the tire plugged before it even goes flat. Jacking a car up on the side of a busy road can be dangerous, you either have the jack in the soft shoulder or it is on the road side and you have to worry about a car hitting you. Instead you can just pop a plug in. However I must admit to not carrying a plug kit in my car so I decided to get this compact kit from Amazon. You will likely need to add air to the tire so it is goo to also have a portable air compressor. My Chevy mini-van with the load leveling system comes with a built-in air compressor to adjust the suspension and it has a port on it you can use for adding air to your tires. It has save me on more than one occasion. I’ve used up everything in my existing plug kit that I keep in the garage so I also ordered a 50 pack of plugs, this should last me almost forever. 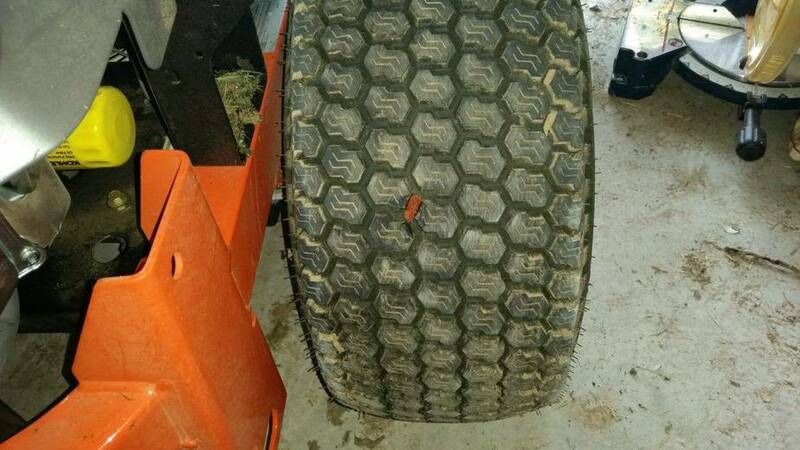 Note this type of repair is only for tubeless tires, which will be almost any car, but things like lawn mowers, tractors and wheelbarrows might have tubes. Bicycles almost always have tubes. 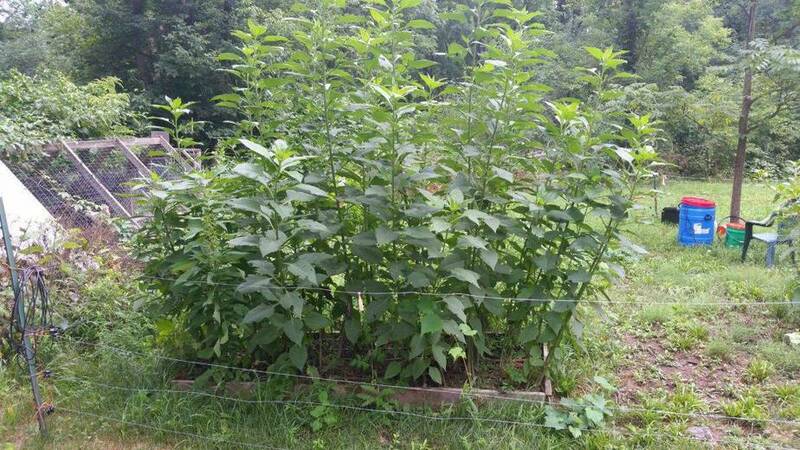 I planted a bed of Jerusalem Artichokes this year. They are something like 8′-9′ tall. To be truthful I’m not sure what I’m going to do with them but they are growing well. I’m considering the tops as fodder for my chickens, but looking on the internet they don’t tend to like it. Hults Bruk, a maker of hand forged axes since 1697 moved into the North American market in 2015. 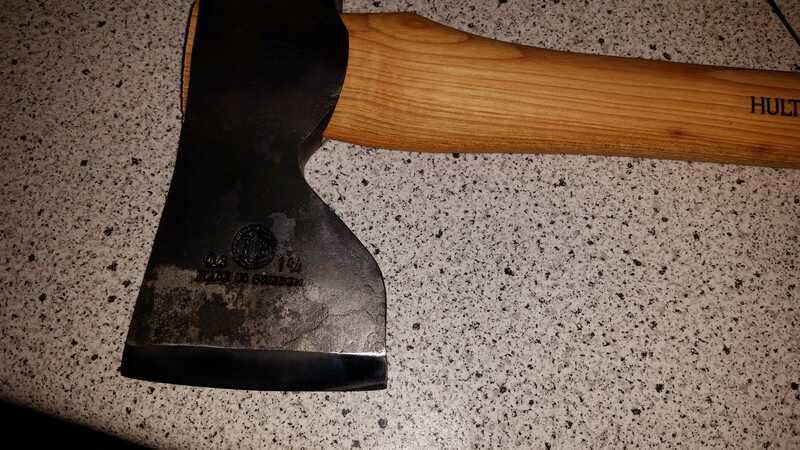 Recently they launched a program to promote their axes via social media. 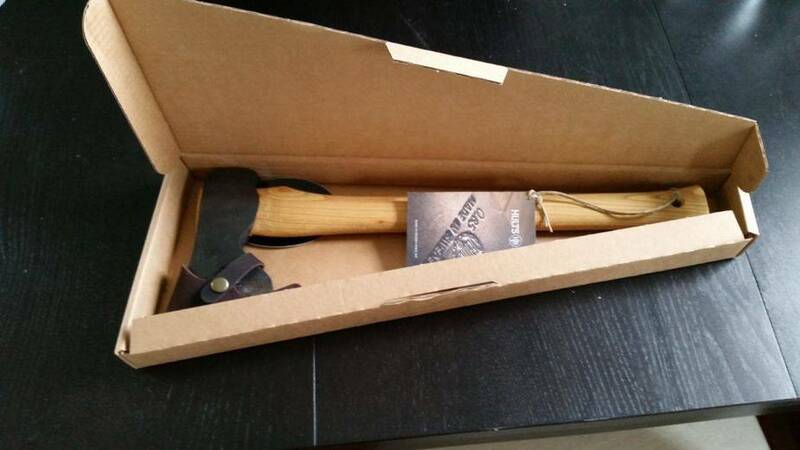 I applied and while was not selected I was a finalist and as such received a free axe to review. I selected the Tibro Carpenter Axe. I have a chainsaw and will be mostly working on my 10 acre property, so I felt a felling axe would be less useful. I’ve always wanted to learn more “rustic” woodworking and a good carpenters axe is one of the basic tools needed. The edge comes very sharp and an almost a mirror finish. The over length is about 20″ with a 1-3/4 lb head. This is definitely not something you want to be out swinging at a tree with as it is too short. However since it is design for more close up work the length isn’t a problem. The finish on the handle does feel a little slick out of the box, I’ll see if rubbing it with to take the sheen off of it. Now I just need some projects to use it on. Below is an interesting video of the forging process.